Getting a table at Nobu can be a challenge (the restaurant is as busy as a Bookies on Grand National Day) but, if you get one, you’ll be rewarded with top notch treats such as the signature Black cod with miso. 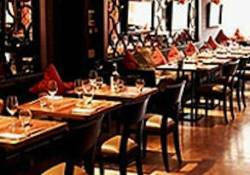 Yet while Mark Edwards’ menu is the main attraction, the interior also elates. Expect a minimalist, chic interior with floor to ceiling windows offering unrivalled views across Hyde Park. 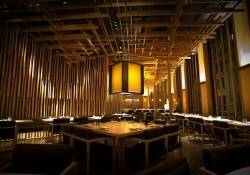 Like its older sister Zuma (see separate entry below), Roka is a swish dining establishment serving seriously good sushi, which works well when washed down by sake (there are around two dozen varieties to choose from). Sushi aside, you’ll find lip smackingly good Grilled baby pork ribs, King crab rice pot & rock shrimp tempura. For pre or post dinner drinks, check out the so hip it hurts Shochu Lounge, in the basement. Enter this drop dead gorgeous Japanese bolthole and prepare for your jaw to drop. Diners ascend an escalator to the first floor dining room, with its swathes of cedar wood, where friendly staff will welcome you like family. Raw fish and Robata dishes are available, but vegetarians haven’t been forgotten about either: don’t miss the Deep-fried mashed taro with shiitake mushrooms and Rocket and agedashidofu. Umu specialises in Kaiseki cuisine – one of the most expensive ways in the world to eat – which originates from Japan’s ancient capital, Kyoto. Standouts include the sushi and grilled skillfish teriyaki. Unsure what to order? Plump for the set Kaiseki course (with or without sushi). 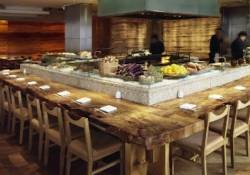 All dishes are served by attractive kimono-clad waitresses in a sleak teak setting. 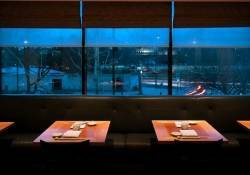 This stylish sushi spot hit the headlines in 2003 after Hollywood heavyweight, Russell Crowe, became embroiled in a brawl. 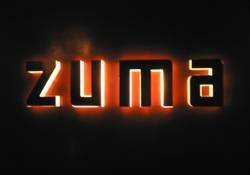 Zuma remains a favourite setting for celebrities in search of a taste of Japan. One of the most talked about restaurants in London, the achingly fashionable eatery offers a broad based array of sushi guaranteed to send shivers down your spine. Save some room for dessert though: boasting innovative choices such as banana cake with coconut ice cream and peanut toffee sauce, dessert is no afterthought but an integral part of the menu.